To qualify NEET is one of the most cherished dream of any medical aspirants. By qualifying this exam a student can get admission into some of the top ranked medical colleges of India. It should be noted that by qualifying this exam only a student can find admission into the Bachelor’s program of MBBS or BDS of any medical colleges whether government or private. Given with the fact that NEET is the national level common medical entrance exam, the level of competition in this exam is very high. Students have to tussle among themselves to grab a seat in some reputed college. A NEET aspirant should work hard right from the very beginning. One must select good books and study materials to prepare for the exam. Below we are giving list of some indispensable Books for NEET 2018 Exam. Problems in general Physics by I.E Irodov. NCERT books of Physics of Part 1 and Part 2. Student should read NCERT books of all subjects prior to reading any other book. The advantage of NCERT books is that it lays strong conceptual foundations in students. NCERT books are written in simple language, easy to understand. Every concepts are explained contextually with numerous examples, that makes it easier for student to understand well, even complex concepts of science. After mastering NCERT books a student can move on to undertake study of advanced books in Biology, Physics and Chemistry. In Biology student after studying NCERT books can take up Truman’s elementary biology to study. This book enriches biological concepts at class 11th level. This is considered as one of the best book for any medical entrance exam especially NEET. Those students who find Truman’s book very comprehensive can opt for Biology book by GRB Bathla and Pradeep Publications. For revision purpose Objective Biology by Dinesh is best to read as it summarises all major points in short. Similarly, in Physics student need to read NCERT books part 1 and part 2 again and again during their whole preparation period. 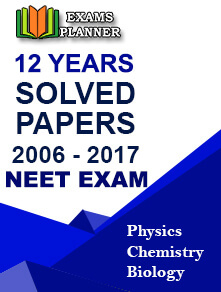 They are advised to solve all numericals of NCERT books thoroughly and repeatedly. Along with NCERT books a student can also undertake to study Physics by HC Verma and DC Pandey simultaneously. HC Verma is basically and elaboration of NCERT Physics books. After finishing these books only, a student should read advanced Physics books by Resnick and Halliday or I.E Irodov. Similarly, in Chemistry a student should read NCERT books and thereafter go on to read higher books in Chemistry like Organic Chemistry by Morrison and Boyd. If a student would study recommend books for NEET 2018 Exam in the aforesaid order then nothing can stop them from qualifying this exam.